오스트리아에서 시행된 전향적 등록 연구입니다 (Drolz A. Hepatology 2016). ICU에 입원한 211명의 간경변 환자들을 조사한 결과, ICU에서 주요 출혈을 경험한 사람들의 1년 사망률은 89%로, 주요 출혈을 경험하지 않은 사람들의 1년 사망률 68%보다 유의하게 높았습니다. 출혈을 경험하는 간경변 환자의 위험인자를 살펴본 보고에 따르면, 다음 중 위험인자가 아닌 한가지는 무엇일까요? 정답) PT는 출혈의 위험인자가 아니었습니다. 낮은 혈소판, 낮은 fibrinogen, APTT 연장은 모두 주요 출혈의 위험인자였습니다. 왜 이런 결과가 나왔는지 보여주는 좋은 그림을 소개합니다 (Tripodi A. N Engl J Med 2011). Re-balance를 이루게 되므로 PT (INR)은 간경변 환자의 출혈을 예측하는 좋은 지표가 되지 못합니다. 간경변에서는 factor VII 감소로 prothrombin time이 연장되지만 Protein C 등 anti-coagulant도 동시에 감소하기 때문에 전체적으로 coagulation system이 (brittle 하지만) re-balance를 이루고 있습니다. 따라서 prothrombin time이 간경변에서는 bleeding risk를 잘 반영하지 못합니다. Re-balance 개념이 중요할 것 같습니다. 간경변 환자에서 procagulants가 감소하는 것과 동시에 anticoagulants도 감소하기 때문에 전체적으로는 균형이라는 의미입니다. Review (NEJM 2011)의 도입부를 옮깁니다. Chronic liver disease, particularly in the end stage, is characterized by clinical bleeding and decreased levels of most procoagulant factors, with the notable exceptions of factor VIII and von Willebrand factor, which are elevated. 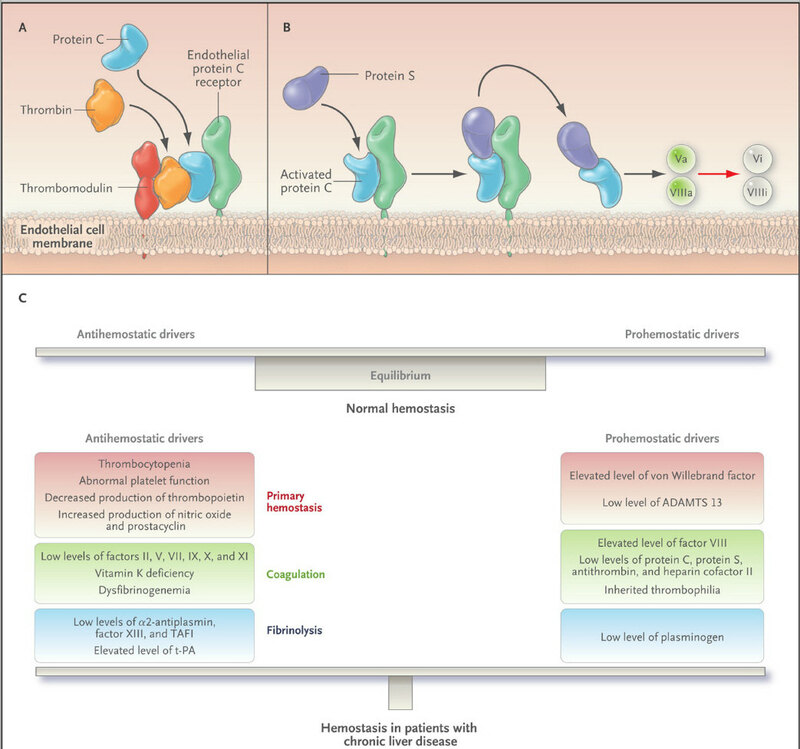 Decreased levels of the procoagulants are, however, accompanied by decreases in levels of such naturally occurring anticoagulants as antithrombin and protein C. In physiologic conditions, the coagulation system is balanced by these two opposing drivers, but the mechanistic significance of the parallel decrease of both procoagulants and anticoagulants in patients with chronic liver disease escaped attention for many years. As a consequence, chronic liver disease is still considered the epitome of acquired bleeding disorders and is featured as such in most hematology textbooks. The basic laboratory tests of coagulation (i.e., measurement of the prothrombin time and activated partial-thromboplastin time) have been used to assess the risk of bleeding. 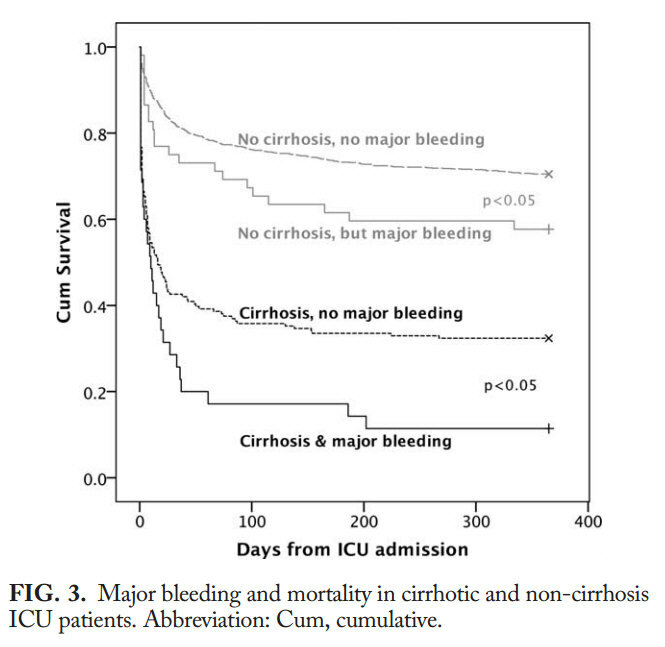 However, their results are poorly correlated with the onset and duration of bleeding after liver biopsy or other potentially hemorrhagic procedures. These test results are also poorly correlated with the occurrence of gastrointestinal bleeding, the prototype of hemorrhagic events in patients with end-stage liver disease. Additional evidence that argues against the clinical relevance of the coagulation defects as detected by conventional laboratory tests in determining the bleeding tendency in these patients can be drawn from the natural history of liver transplantation. In the past, this major surgical procedure required massive transfusions of plasma and other blood products to correct the marked abnormalities on tests of hemostasis (assessments of coagulation, platelets, and fibrinolysis) observed both preoperatively and perioperatively. The need for transfusions, however, has declined considerably over time -- not because of any substantial change in medication, but rather because of improved surgical procedures. Finally and most important, randomized clinical trials involving patients with chronic liver disease have shown that powerful procoagulant agents, such as recombinant activated factor VII, fail to control bleeding from the upper intestinal tract or bleeding during liver transplantation, even though the postinfusion prothrombin time is considerably shortened. In this review, we consider the evidence regarding the balance in the hemostatic system (involving coagulation, platelets, and fibrinolysis).